This doll has a story behind it. It is the first doll I was involved in rescuing. Several summers ago, my younger sister and I were running errands in the town near where we vacation. We decided to stop in the local antique store to look around. In a small, dimly lit, back room we came across a pair of dusty dolls on a lower shelf. 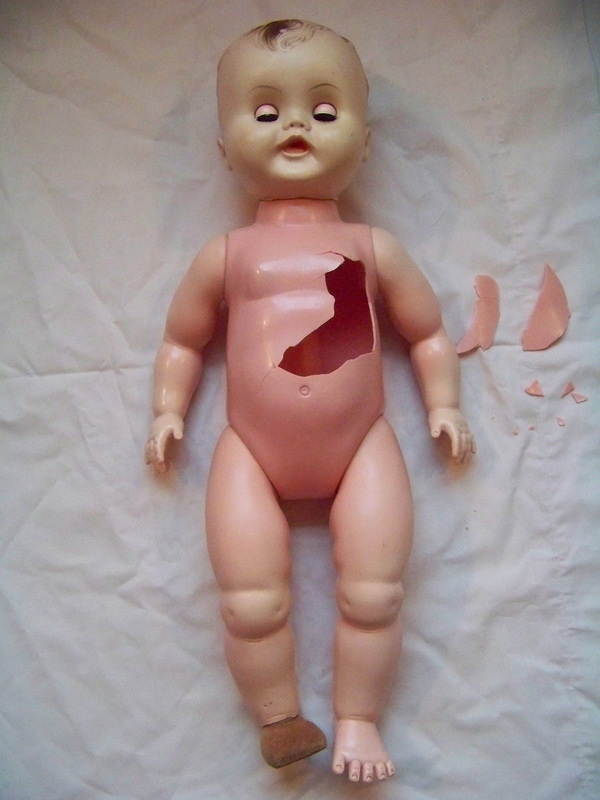 The first was a stuffed rubber doll and the second a large, hard plastic baby doll. 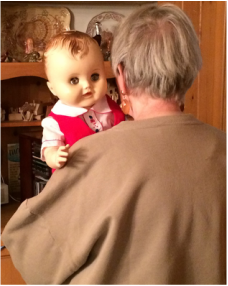 My sister immediately began looking them over for manufacturer marks and possible defects so that she could give a full report to our sister (the avid doll collector). 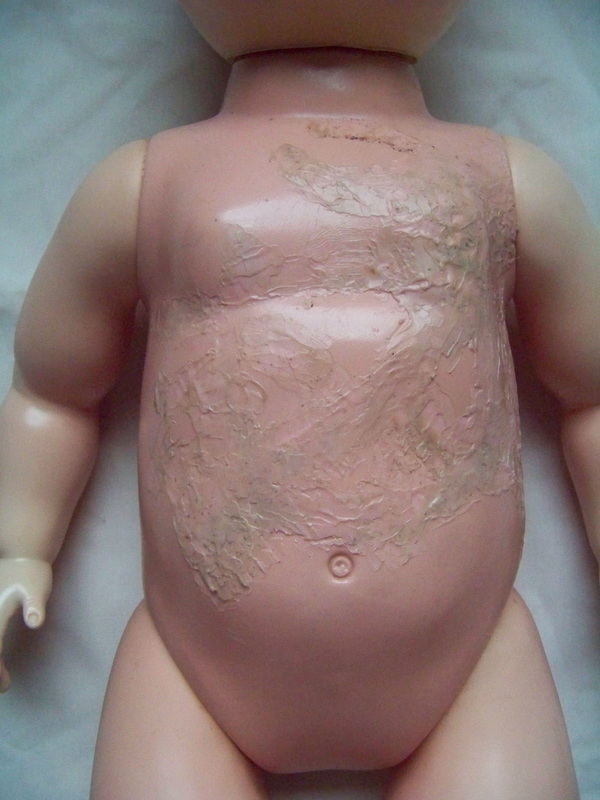 The large baby doll had a mark on the back of its neck that looked like "A-" followed by two blurred characters, with "24" and more garbled characters beneath it. (Later we found that each of the arms and legs was marked 24-53 (or possibly 58)). While inspecting the doll for defects, my sister squeezed the doll's right foot through its clothing and said it felt funny. She removed its clothing to reveal that the original foot had broken off and been replaced with a crudely whittled wooden foot. We immediately felt empathy for the old doll but realized it probably wasn't worth the $10 price tag. 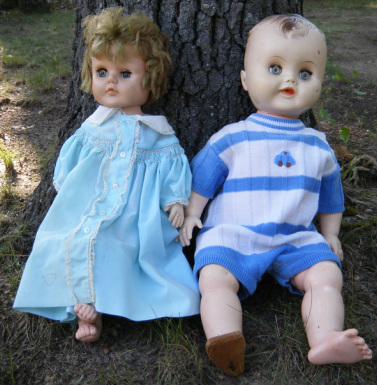 On the drive back to the vacation home, we started concocting all sorts of stories about how the doll had lost its foot due to reckless brothers, teething pets, or other such incidents. We imagined that a broken hearted little girl had shown the injured doll to her kindly grandfather, who whittled a replacement. 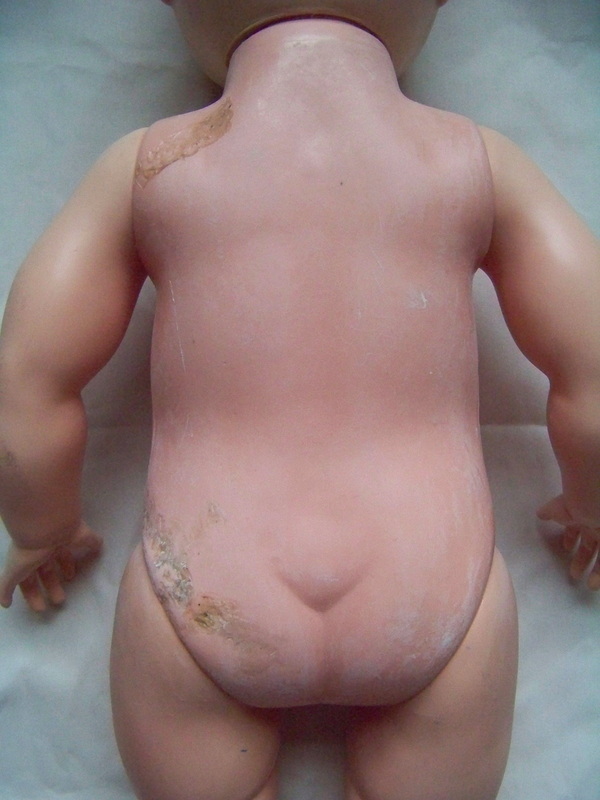 We nicknamed the doll "Stumpy" because of his wooden foot. We related our discovery, and our imagined histories, to our sister and mother at lunch. They both wanted to go back and see the doll and its repaired foot. 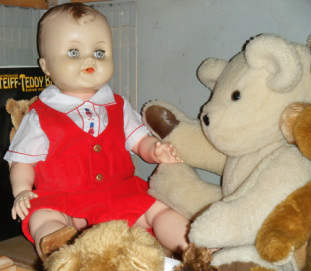 Upon returning to the antique shop, they saw the doll and felt the same empathy for it that we had. They negotiated the price down to $8. "Stumpy" proudly rode home sitting on my mother's lap while looking out the car window. "Stumpy" (on the right) with his stuffed rubber sister after being rescued from the antique shop. A close-up of his whittled wooden foot. He was pretty dirty when we found him - notice the missing eyelashes on one side. A side view of the wooden foot. 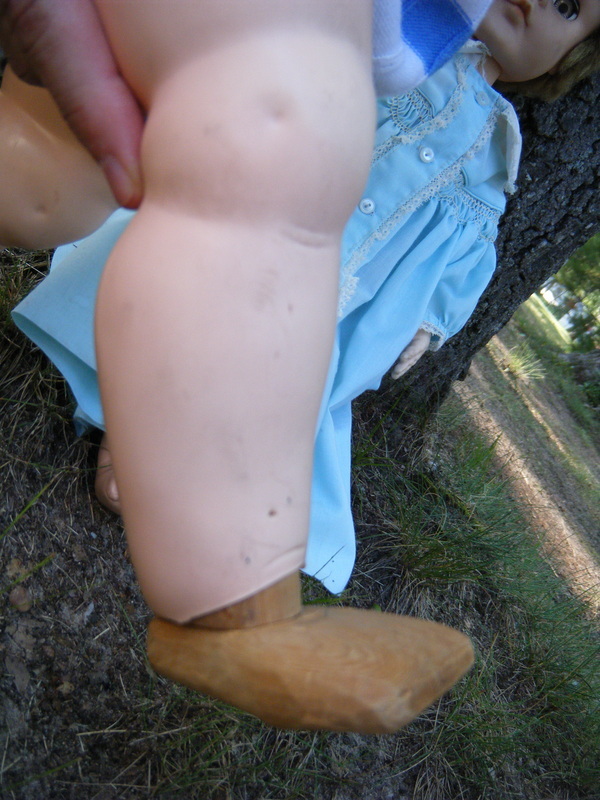 My original plan had been to create a more life-like replacement foot, but my mother ultimately decided (and rightfully so) that the wooden foot gave the doll a distinct personality. So my sister cleaned the doll and my mother dressed it in a little admiral suit and put him in a play room for the grandchildren. Stumpy was happy in his new surroundings for a few years. One day an accident occurred. No one knows how or when it happened, but Stumpy was found slumped over in his sailor suit. While adjusting his clothing, my mother found that his body was caved in and shattered. My mother sadly informed me that Stumpy had died and would have to be thrown out. I requested that she not do anything until I could see the doll on the off chance that it could be saved. 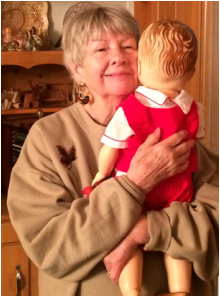 She solemnly turned the doll over to me in a sealed gray plastic bag. I fearfully opened the bag. As can be seen in the photos, the damage was extensive. 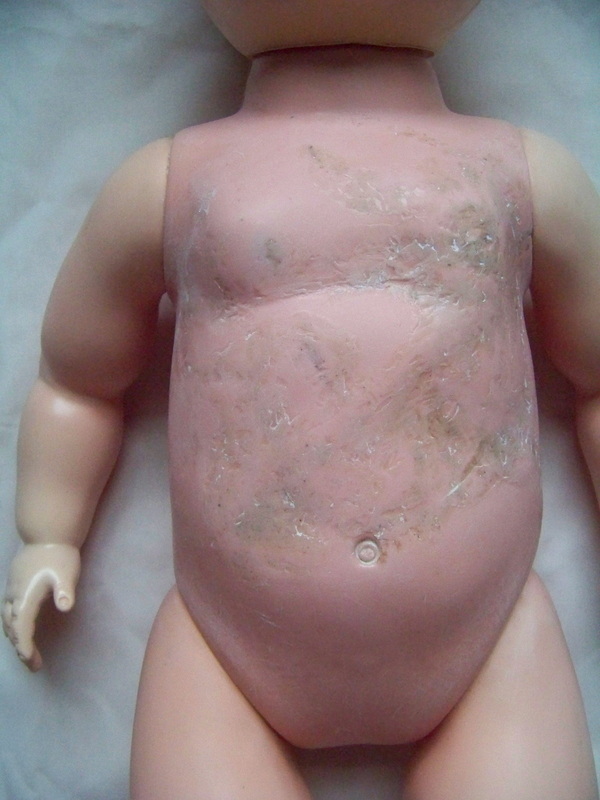 The hard plastic had become brittle and even the intact portion of the body was covered with hairline cracks. 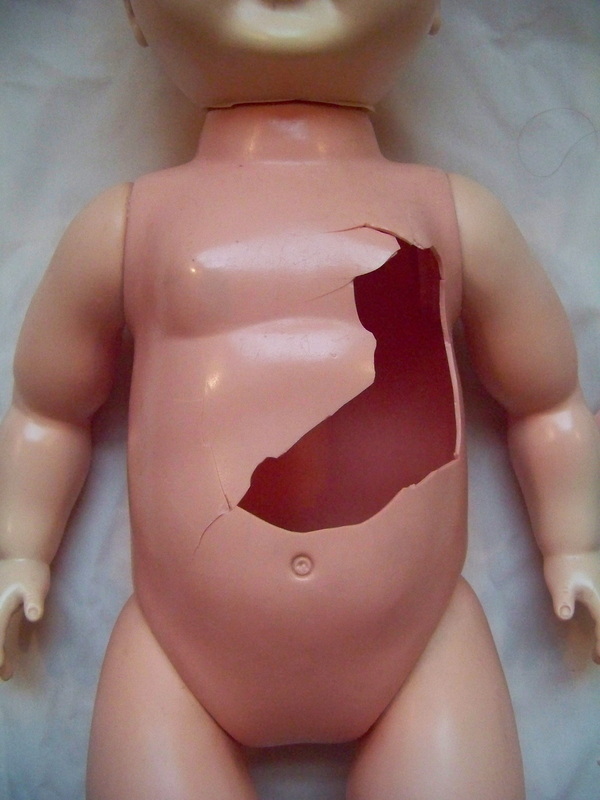 I decided that I would save the doll in one of two ways: either reassemble the original body if all the pieces could be found, or create a replacement torso from balsa foam. Most of the pieces were in the bag but a few small portions were missing. My plan to use a soldering iron to fuse the plastic pieces together had hit a snag. 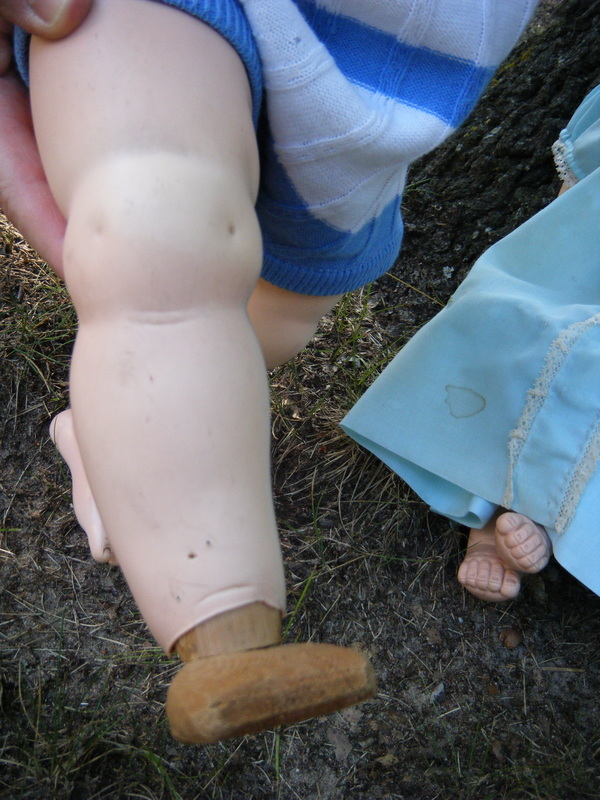 While photographing the doll, I noticed that the legs still had the plastic punch outs inside them. I realized that they could be melted into gap filler. It took several hours of painstaking plastic soldering to put Stumpy back together. The hairline cracks would not seal by just brushing the soldering iron over the surface. I ended up having to run the soldering iron down each crack and then smearing the molten plastic over the wider gap to get a good seal. The finished surface was pretty rough and showed dark patched where plastic particles overheated and burned on the soldering iron. I used a medium grit sandpaper to smooth the rough parts but I had to be careful not to thin out the fragile body more. I finished with wet/dry paper. Stumpy can return home, but he will have to move to a higher shelf to watch the grandchildren play. Since Stumpy has become so fragile, it was decided that he shouldn't resume wearing his sailor suit. Another option was needed. My daughter lives in Colorado and corresponds with my mother on a regular basis. When my daughter visited a state park in Colorado she received a trackable dollar bill as change when paying the admission fee. She sent the $1 to my mother to spend on something fun to send it on the next leg of its journey. While at a local doll show, my mother found a nice new outfit that would fit Stumpy that cost exactly $1. Although Stumpy is no longer able to go on adventures, he can have new experiences by tracking his lucky dollar as it travels the world. He looks more grown up in his new clothes and is spending time with his friends the teddy bears. Front view of the shattered torso. The inside of the leg had a loose plastic punch out that could be used as a source of additional plastic for the repair process. The stamped "24-53" is visible on the inside of the upper thigh. Each limb has the same marking. 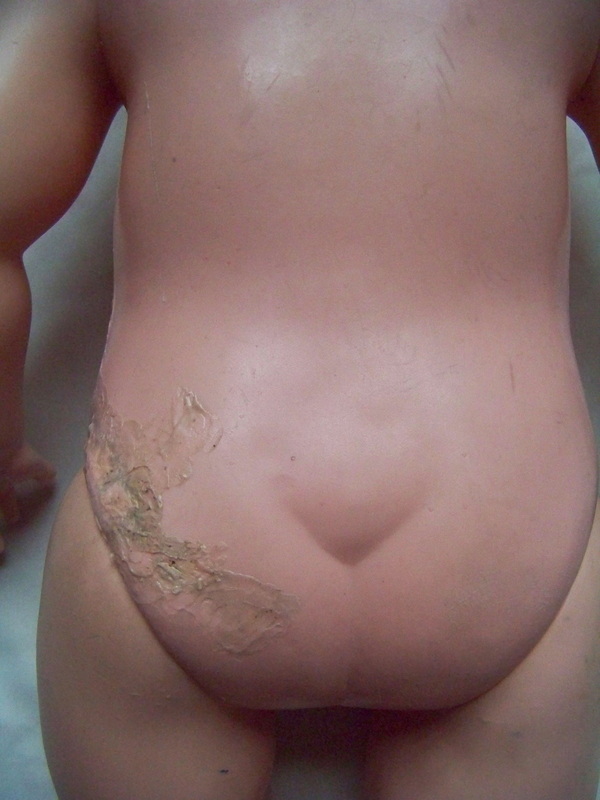 After soldering all the pieces into place and sealing the hairline cracks the doll looks like a burn victim. I sanded the rough spots with medium grit sandpaper and then finished with wet/dry paper. Close-up of the damage. 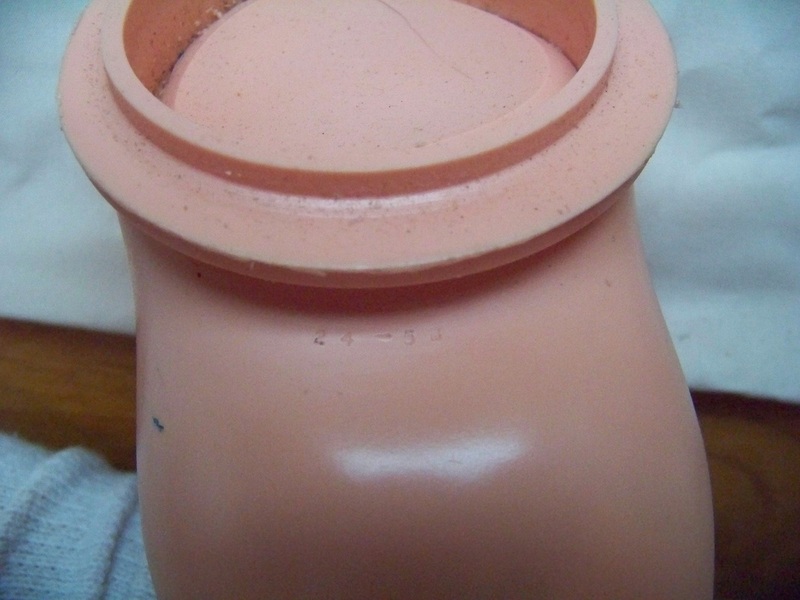 Many hairline cracks are not visible. Additional pieces kept breaking off during the repair because the body is so brittle. 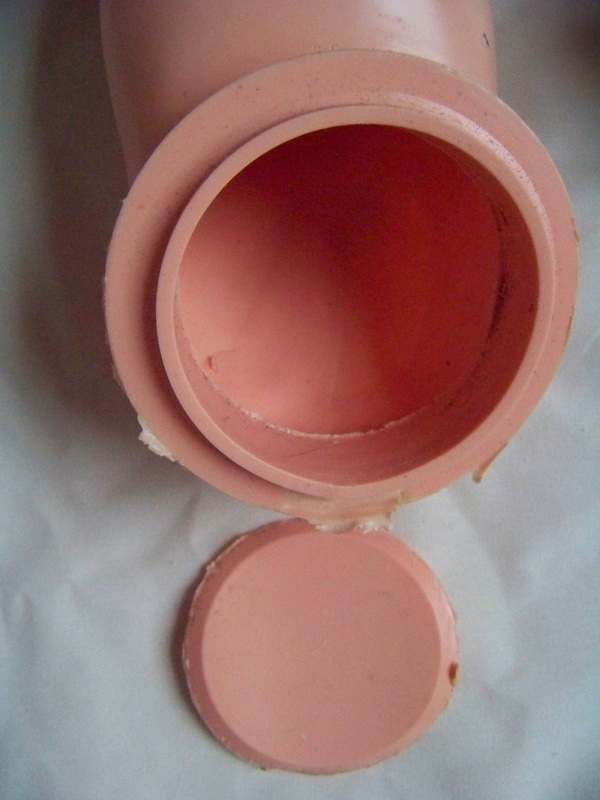 The leg with the punched out plastic removed. 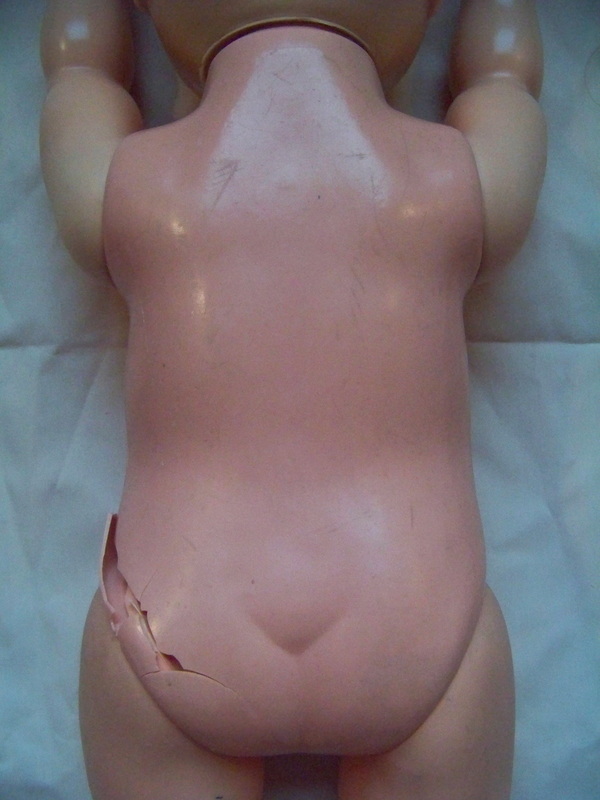 Several hairline fractures were found around the shoulders. I sealed them to keep the arms from falling out. While the finished product is not pretty - Stumpy will be able to return to the play room. The back side does not look too bad in the photo - but the hip attachment was broken such that the leg could be removed. 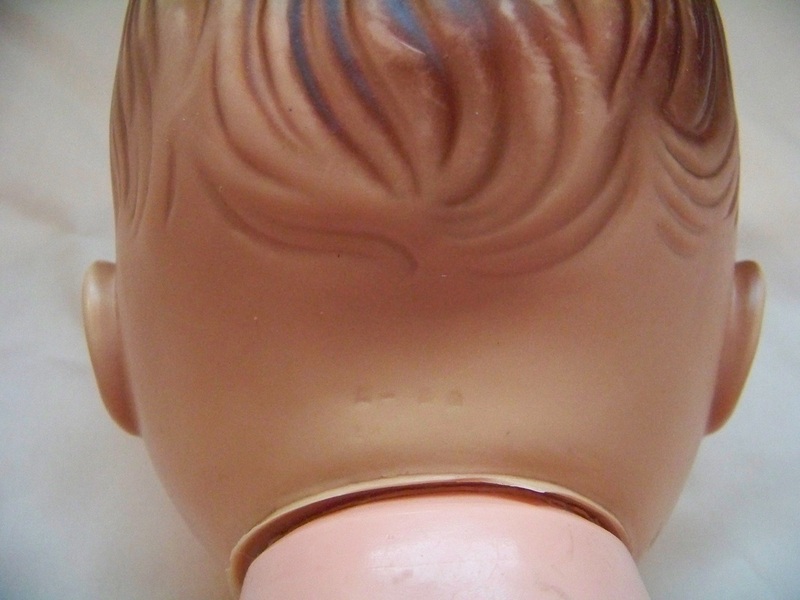 The two rows of markings on the back of the head are indistinct. It is possible that this was intentional if Uneeda was distributing the doll as unmarked. The side of the body kept crumbling during the repair process and needed more work than I originally thought it would. Stumpy is happy to be reunited with his adopted mother. Stumpy dressed in his new finery and spending some quality time with his friends the teddies.